Walk With Me...: Weather....or not. 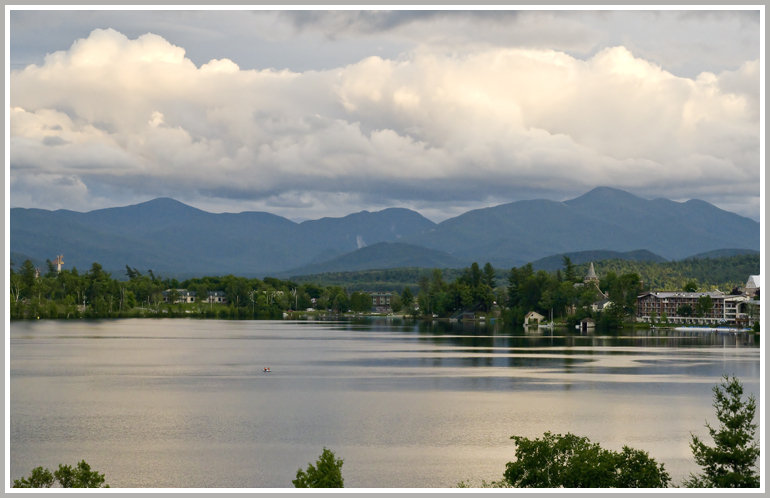 View from our room of Mirror Lake and the village of Lake Placid. Weather is always such a big factor in a vacation....especially with my family. And, so far, the weather has been iffy at best. I try and plan for all weather possibilities. I always want something to do. Ideally, we'd be out enjoying the area by hiking to high peaks or looking for waterfalls. But, no one really wants to get five miles out and then caught in a pouring rain. Yesterday, we got rained on a couple of times, but the rain was light and short lived so it wasn't bad at all. Just in case, I always pack books, projects, misc. art supplies...things to engage us if we can't be out. I usually can keep myself, and one or two of the kids busy and happy. My "strict" girl scout upbringing = always prepared! Aaron looked at the weather forecast last night and went into a bit of a funk. Today, it's supposed to be overcast and chilly...high 50's. He grumbles like there's something we can do about it. I'm actually glad to hear that the weather is supposed to be cool. Since I've passed age 50...I'm too warm all the time anyway. I'm much more willing to venture out appropriately layered for cool weather than walk into the blast furnace of real SUMMER weather. I find this weather, a relief. No one else in the family is up yet....I've got to get them moving so we won't miss breakfast. Then, the discussion will begin....with all the overtones of disgust because it's not sunny and 80 degrees. What to do, what to do? I think I can jolly my children through it and "save the day". In regards to the husband, I'm not so sure. God...how happy I am that I don't have a family to entertain when I'm on vacation. You and Aaron have hung in there with each other for so long, you've made it through some difficult times ... I'm sure you will make it through this too, you always do. However, reading this reminds me that I am happy not to have to jolly someone else up when on vacation anymore. Anyway ... the lake looks beautiful I'm sure weather or not you'll have a great time. We took a February vacation in Lake Placid last year. Talk about cold!!! We also took a summer vacation in the area many years before that and it rained every single day,so I feel your pain. It's beautiful country though, hope you're able to enjoy the getaway, bad weather and all. I have good memories of canoeing across that lake with young children during a wonderful week of camping up there!